Woods might be bidding for his 15th grand slam title and his first green jacket since 2005 with Mickelson gunning for the world No 1 spot and McIlroy trying to become the youngest champion. But when asked if he was intimidated by anyone after winning three of the last six majors, Harrington said: “Yes. Me. I am very afraid of myself and that’s who I have to look after. “I have enough fear going through my own head to manage without worrying about the other side and I think that’s why I have done well in the three wins I have had. Harrington proved in the Open at Birkdale last year that he is not afraid of pressure. He staved off the challenge of the Great White Shark, Greg Norman, to win by four shots thanks to a sensational back nine of 32. He went on to win back to back majors by denying Sergio Garcia in the US PGA at Oakland Hills with another 32 coming down the stretch. But he get more of a kick out his Open defence because he was expected to win and pulled it off despite his inner fears. He said: “The hardest thing is coming down the stretch when you should win and thankfully I did it nicely at Birkdale. “When you should win obviously the pressure is on you. When you come down the stretch when it is 50-50 or you are the slight underdog, it is a lot easier to be a lot freer about what you are doing because you don’t fear losing quite as much. Harrington has decided to make patience his watchword this week and his work with mental coach Bob Rotella will be vital to his chances. But there are no magic formulas that will allow him to turn up on the first tee today feeling bullet-proof. He said: “That’s the great thing about Bob Rotella. Everything I work on with Bob Rotella are the same things I have worked on with Bob Rotella for the last ten years and they are the same things that are written in his books. “There is no magic potion. There is no secret unfortunately. It is all there for public digestion and it is a matter of applying it. 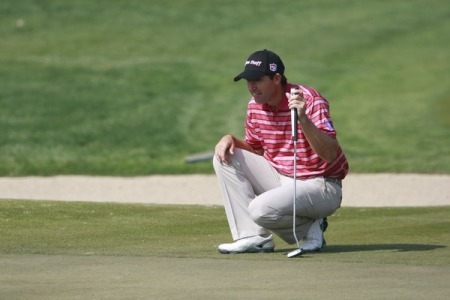 What makes Harrington a hot tip for Masters glory is the fact that he loves the tough challenge the course presents. While many of the players are moaning about its difficulty, Harrington uses Augusta as a yardstick to judge his game. He said: “If you have the game to cover the challenges that you are asked to cover at Augusta, you can play any golf course. “So whenever I am practising, whether it is a chip shot or a putt or an iron shot or a drive, I am always thinking: Is this up to the standard that would get me around Augusta? “If you can play Augusta, you can play anywhere. But you are not going to win by luck. You are going to be on top of your game and you are going to have the ability to play golf in all departments of your game. “You are not going to get away with just being a good putter or a good chipper or a good driver. You gave to have all departments that week and I rate it incredibly highly.